As toddlers begin to master language and mobility, they discover a whole new world. They begin to interact on a more complex level with their peers, parents, and teachers as well as with their physical environment. At HPCDC, we encourage toddlers to use their budding skills to solve problems, make choices, and practice self-help skills, all of which empower them with the independence and self-reliance that builds self-esteem. 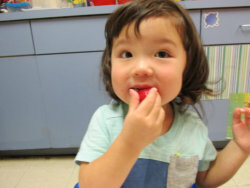 Our curriculum is packed with real-world, concrete, sensory experiences where toddlers can touch, see, taste, hear, and smell. 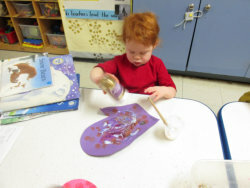 We use a wide variety of themes to stimulate growth, development, and learning. Special activities are used to help your toddler build cognitive, language, motor and social skills, and self-esteem.